Happy can't skate very well, and when he's not chosen for the hockey team, he beats up the coach. Life seems to hold no future for him. After his father's death he is taken in by his beloved grandmother (Francis Bay), and then a crisis strikes: The IRS seizes Grandma's house and possessions. How can Happy possibly earn $275,000 to pay all of the back taxes? During a visit to a golf driving range, he discovers a hidden talent. He can hit the ball hundreds of yards, straight as an arrow. He's taken under the wing of a veteran golf pro named Chubbs (Carl Weathers) who tries to teach him the game, but it's Happy's tendency to explode and pound his clubs into the ground when he misses a shot. Happy's long game is great but his short game stinks. He goes on the tour, where the defending champion, Shooter McGavin (Christopher McDonald), becomes his archenemy. They go mano a mano for weeks, in a series of golf scenes that are too heavy on golf for non-golfers, and too irrelevant to the ancient and honorable game for those who follow it. At a pro-Am tourney Happy teams with Bob Barker, whose fight scene seems longer in the preview trailer. 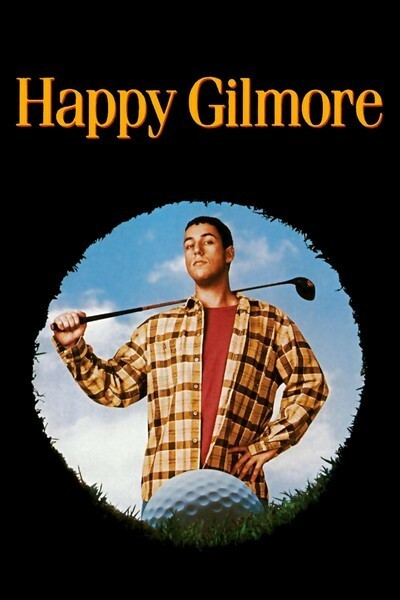 The Happy Gilmore character is strange. I guess we are supposed to like him. He loves his old Grandma, and wins the heart of a pretty public relations lady (Julie Bowen) who tries to teach him to control his temper. Yet, as played by Sandler, he doesn't have a pleasing personality: He seems angry even when he's not supposed to be, and his habit of pounding everyone he dislikes is tiring in a PG-13 movie. At one point, he even knocks the bottom off a beer bottle and goes for Shooter. It was a Heineken's beer, I think. The label was a little torn. Maybe nobody paid for product placement. "Happy Gilmore" is filled with so many plugs it looks like a product placement sampler in search of a movie. I probably missed a few, but I counted Diet Pepsi, Pepsi, Pepsi Max, Subway sandwich shops, Budweiser (in bottles, cans, and Bud-dispensing helmets), Michelob, Visa cards, Bell Atlantic, AT&T, Sizzler, Wilson, Golf Digest, the ESPN sports network, and Top-Flite golf balls.